In addition to the core experience, Concrete Genie will feature two distinct PlayStation VR modes that are co-developed by SIE San Mateo Studio. On the PlayStation Blog, Jeff Brown, Creative Director at San Mateo Studio, provided an overview of what players can expect from the two PSVR modes, which are called VR Experience and PSVR Free Paint Mode. The first of the two modes, VR Experience, will allow players a chance at getting “to know a Genie one-on-one.” A Genie named Splotch will serve as the star of this mode, who ventures below the lighthouse that towers above the small town of Denska. While exploring, Splotch will “unlock a mysterious power.” Of course, Brown wouldn’t divulge what this new power entails. However, he did tease that its discovery will require players to use the Living Paint abilities in a way that greatly differs from their function in the core game. PSVR Free Paint Mode pretty much speaks for itself. Yet, the immersive qualities of first-person in virtual reality means this particular experience may feel leaps and bounds above anything else. 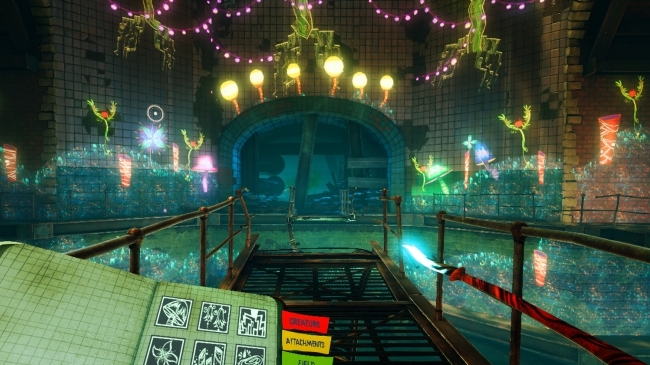 In this VR mode, players can choose from four different locations in Denska to “play and experiment with all [of their] Living Paint and Genie creation brushes.” The immersion, according to Brown, will be further compounded by the use of PlayStation Move controllers, of which two are required for both of Concrete Genie’s PS VR modes. As noted in the PlayStation Blog post, the PSVR modes for Concrete Genie are slated to launch alongside the main game. This announcement is but another boon for PlayStation VR as a whole, since a number of experiences will hit the platform this year. Other recent reveals of note include a No Man’s Sky VR mode and Marvel’s Iron Man VR. Following another delay, Concrete Genie will now hit the PlayStation 4 sometime in Fall 2019.